The Shure A120S In-Line On/Off Switch is an in-line, balanced, locking or momentary switch for a microphone. The A120S can be configured in several ways to meet different user requirements. Typical use cases include adding Latch On/Off, Push-To-Talk, or Push-To-Mute (cough button) to a microphone. The A120S is contoured to fit comfortably in the hand, and an attached belt clip rotates to four positions to allow convenient mounting. The A120S can be wired Normally-Open or Normally-Closed, and can be used with a balanced mono audio signal or an unbalanced stereo audio signal. (Note: A120S is supplied unterminated; the installer must solder appropriate wiring to provide the function desired.) Its pushbutton combines with a rotary knob to provide either spring-return momentary or locking action. The unit is supplied with a crimp-on strain relief for 6.4mm (0.25-in.) diameter cable and with a flex relief for either large or small diameter cables. 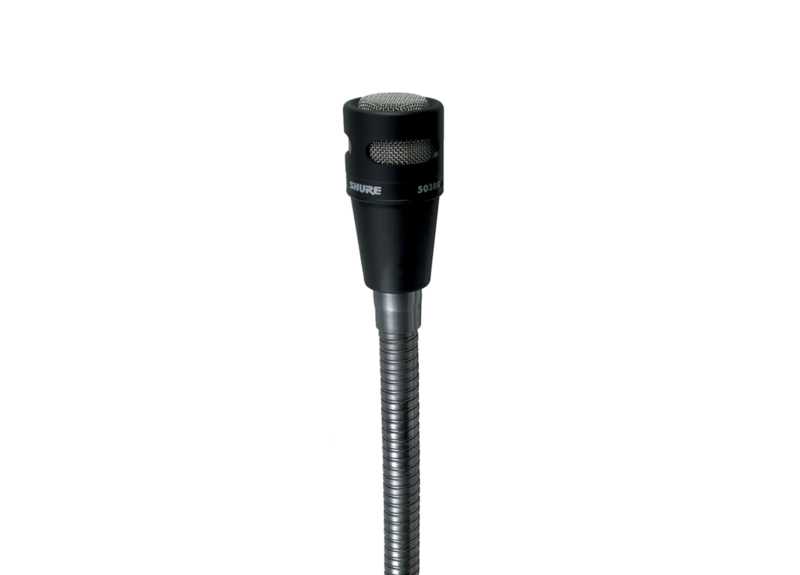 Close-talk microphone delivers excellent voice fidelity for fixed station applications with high background noise levels. Features include a hum-bucking coil to reduce induced noise and a frequency response tailored for voice communications.